Belinda's life is in free-fall after the sudden death of her fiancé Andy. But then ghostly signs begin to appear which suggest he might not really be gone. And Belinda begins to tumble even further - until she finds his final parting gift. But will it be enough to save her? Evelyn McGavin, Andy's mum, is also struggling in her bereavement. She copes with her sorrow by shoplifting (once), hating Belinda (constantly) and jumping out of a plane. In her skydiving instructor, Baz, she finds an unexpected friend. But why is he so agitated when he hears how Andy died? Oh, so you can see I liked it. More than just a lot. Every now and then a book comes along that just is the perfect fit for me. A book that reminds me how much I love to read. How much I love falling in love with characters. How much I love gorgeous and funny and whimsical and perfectly put together prose. A book that I cannot keep away from. And when I have to leave it, I am finding any moments in my day to squeeze in a few more sentences. Even better, this was a book where, upon finishing, I went back through for the next couple of days. Just not ready to move on from the characters and the world. I truly, sincerely, crazily loved this book. Just thinking about it now has me smiling and sighing, remembering the good times the book and I had together. This book is just so utterly charming. It had it all for me. I ached (surprisingly, a lot) with genuine sadness and regret. I swooned (oh my swoon!). I laughed. I felt inspired. I loved every single thing about this book. There's mystery elements, murder, sky-diving, manic-like shoplifting, grief, love, people behaving badly, mixed-messages, possible ghost-lingering, quirky coincidences and despair all wrapped up with humour, fun, sincerity and whole lot of heart. I loved the plot, original and true and slightly bizarre. But, more than that, I adored the characters. And when I fall in love with characters, that provides the ultimate reading experience, because for that moment, while I am with them, they are real to me. Very endearing flawed characters. What a gorgeous, life-affirming, moving, whimsical, original debut. With one book, Nicola has bounded on to my all time fave authors list. I plan on rereading this very soon. In fact, I feel nostalgic about it every time I think about it, haha. Oh, so, no review-type synopsis from me. You can find them in reviews on goodreads. I much prefer to just chat (or in this case, gush) about how much I loved this book so. This review made me smile, Nomes! 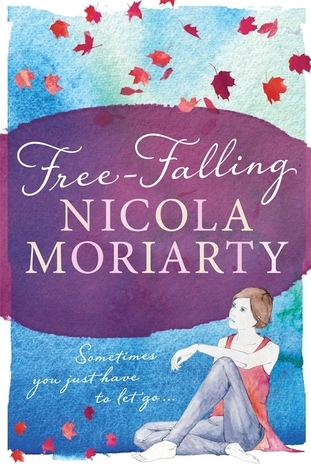 I can tell how much you loved it and I really, really want to read Nicola's debut book! Gosh that family is talented! I thought the last name sounded familiar! I haven't read this yet but I read Liane's blog post about it when it came out. I need to get my hands on this! This sounds great, hope it becomes available internationally! SPOILER ALERT: It's Holier Than Thou. But in all seriousness, if this is your favorite read so far this year, I will read it by year's end. This is why I look to you for my latest Aussie recommendations! The way you talk about books you adored makes me fall in love with reading again!